There is a craft to creating landscapes that sustain nature and enhance our sense of place. It links us deeply to our local natural world, through the cultivation of native plants and the creation of wildlife habitat. Our homes can include communities of wild birds, beautiful pollinators, intricate wildflowers, fruiting shrubs, healing herbs, and the many other unseen organisms that together sustain biodiversity at a time when all wild beings are threatened with losing their habitats. If we expand our notion of natural habitats to include our front and back yards, our homes become habitats as well. The next time you walk in the "wilderness", the wild will be more like home, because your home will be more like the wild. 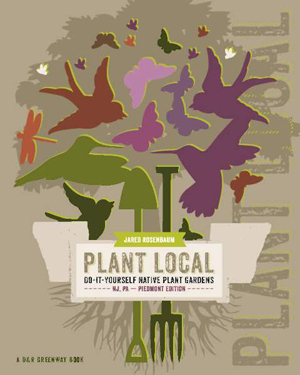 Written by Jared Rosenbaum and informed by the land stewardship and native plant nursery that are part of D&R Greenway Land Trust's work, Plant Local is a guide to native plant gardening through do-it-yourself projects based on the ecology of our region. Profits from the sale of the book benefit D&R Greenway's ongoing land preservation and stewardship mission. Did you know that right here, in the center of the most densely populated state in our nation, there are thousands of acres of preserved open space? Nestled among the many homes, corporate office parks and busy roads, there are miles and miles of trails to enjoy. Walk the Trails In and Around Princeton will serve as your guide to these beautiful, but often hidden places. Sized to fit in your back pocket, Walk the Trails In and Around Princeton features detailed instructions and trail maps for sixteen walks through our local parks and preserves. It also contains sixteen beautiful full color postcards and many other stunning photographs of our local open space. 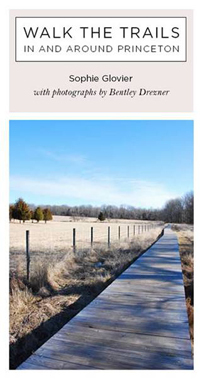 Walk the Trails In and Around Princeton was created by author, Sophie Glovier, photographer, Bentley Drezner and book designer, Maria Lindenfeldar. It was printed by Enviroprint of Bound Brook, New Jersey, using soy inks on sustainable papers. Profits from the sale of the book benefit D&R Greenway's ongoing land preservation and stewardship mission. From the glacially scoured quartzite ridge that hosts the Appalachian Trail to the spectacular columnar basalt of Orange Mountain, New Jersey packs a boatload of geology into a small area. Its nineteenth-century marl pits were the birthplace of American vertebrate paleontology, bog iron deposits in the Pinelands were used to produce cannonballs for the Revolutionary War, world-famous fluorescent minerals are found with zinc deposits in the Franklin Marble, and the coastal plain sediments contain convincing evidence of the meteorite impact that killed the dinosaurs. This absorbing book opens with an overview of the state's geologic history and proceeds with 13 road guides that unearth the stories behind the state's rocks, sediments, and barrier islands. 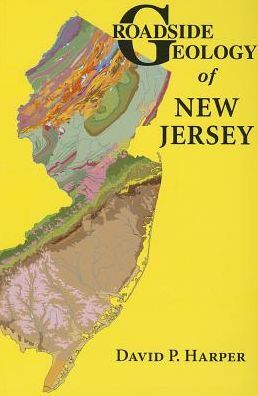 More than just a guide, Roadside Geology of New Jersey is chock-full of insightful discussions on such timely topics as sea level rise, climate change, and uranium mining. Get the scoop on why so much sand moves during superstorms such as Hurricane Sandy, and learn about more than a century of efforts to stabilize the beaches along the Jersey Shore. Profits from the sale of the book benefit D&R Greenway's ongoing land preservation and stewardship mission. Please note that your book(s) will be mailed to your billing address. If you would like your book(s) to be mailed to a different address, please specify that in the Notes section.